Click here to add AME to your IMTS Show Planner! Also see their sister company Hennig Inc. for machine protection products at booth E-5610. Click here to add Hennig to your IMTS Show Planner! Also see their sister company, Advanced Machine & Engineering Co., at booths W-2405 and E-5718 for machine tool component products. AME is taking it to the next level with Inbound Marketing + Social Media + CRM + Tradeshows. Advanced Machine & Engineering Co. (AME) has achieved manufacturing excellence over the last few decades by providing some of the highest quality machine tool component products and services the market has to offer. Now, we are taking the next steps to improve our business and increase our market share even more. It hasn’t always been easy getting from where we were nearly 50 years ago to where we are now. But we can honestly say the hardest parts are behind us. You can only improve products and processes so much before there is little to no room left for improvements. Although we will continue to innovate further, we have successfully neared that point in our manufacturing processes for a few reasons. During the maintenance and repair operations of A-10 Warthog aircraft at Hill Air Force Base in Utah, a unique product design from Advanced Machine & Engineering (AME) helps maintain the structural integrity of this heavy airframe. AMLOK® pneumatic rod locks keep the load steady and ensure the aircraft will return to flight in its proper configuration. Boeing in St. Louis designed and built the fixtures for the Air Force and specified the rod locks, 28 on each of five (5) fixtures constructed for use at the Air Force base. In use, each rod lock holds up to 5000 lbs. and maintains position with 0.002”-0.003” maximum backlash and repeatable positioning. The AMLOK® design functions by holding the cylinder rod in place and locking the load in place, when air pressure is removed. Only when the pressure is restored can the load be released. This power-off clamping protects operators and workload alike. The Air Force contracted Boeing to produce a series of fixtures to help perform major structural repair operations on the A-10. This was a new product design, conceived by Boeing, to solve the problem of holding the massive A-10 airframe in position while major structural sections were removed and replaced. In application, the rod locks provide a means of attaching the main fixture to the aircraft structure without introducing any external load to the structure. This fact is key to the overall repair operation, as the original shape of the craft must remain consistent during and after the repair. In addition, since the locking feature on the rod lock is activated when the pneumatic power is removed, it prevents inadvertent activation of the lock during the repair process, increasing technician safety substantially. 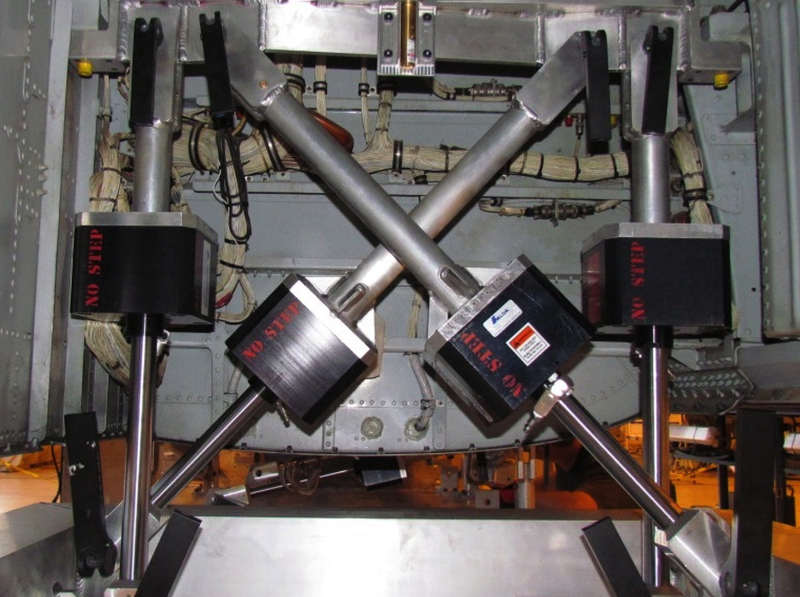 Another aspect of the AME rod lock design, they provide an uncomplicated, easy-to-install interface between the main repair fixture and the surface of the fuselage on the aircraft, doing so in a way that prevents the introduction of positive or negative loads to the fuselage in the resting position. Prior to start-up of operations, laser tracking measurements of the A-10 Warthog fuselage were consistently monitored by Boeing personnel during the initial prototype repair processes. In operation, rod locks are positioned at seven (7) points on both sides of the fuselage along its entire length to provide adequate structural support. These points of contact also provide convenient attachment points on the aircraft, in relation to the components typically installed. In removing and replacing large sections of the fuselage, excess pressures can be exerted on the airframe, a potential cause of distortion. Jack Bucheit, the lead tool engineer at the Boeing facility in St. Louis, notes, “The size and weight of the aircraft necessitated a unique solution. Our requirements exceeded the capacity of the standard rod locks catalogued by AME in size and weight ranges. AME stepped up and developed, then tested and supplied a specific rod lock designed to our specifications for this application. The performance was in line with all our expectations.” Others on the Boeing team included Jerry Dunmire, A-10 program manager, Dan Dudley, project manager and Brad Moore, tool engineer. The AMLOK® rod locks on these fixtures minimize the over-travel, drifting, bouncing and reverse travel often encountered in pneumatic motion applications, according to the engineers consulted for this story. Acting as the representative for AME on this project was Ray Varady, president of V-TEC Machine Tools, Inc. in Glen Carbon, Illinois, near St. Louis. Shane Hatfield, sales manager at AME, led his team in the design and delivery of the rod locks to Boeing, who subcontracted the building of the fixtures to John Wisker and his team at WB Industries of O’Fallon, Missouri, also near St. Louis. Advanced Machine & Engineering Co., is a manufacturer located in Rockford, Ill., serving the Machine Tool Industry with precision components and accessories, including spindle interface components, workholding devices and, through our sister company, Hennig, machine enclosures, chip removal and filtration systems. The Fluid Power – Safety markets are served with cylinder rod locks and Safety Catcher devices; and the Production Saw market with our AmSaw carbide saw machines and Speedcut blade products. AME has manufacturing partners and service centers around the world and across the U.S. To learn more, visit www.ame.com. Hennig, Inc. designs and produces custom machine protection and chip/coolant management products for state-of-the-art machine tools. Hennig products are designed to protect against corrosion, debris and common workplace contaminants. Manufacturing facilities are located in the U.S., Germany, France, Czech Republic, Brazil, India, Japan and South Korea. Repair centers are located in Machesney Park, IL; Chandler, OK; Livonia, MI; Blue Ash, OH; Mexico City, Mexico; and Saltillo, Mexico. To learn more, visit www.hennigworldwide.com. In its production of various cylinder and related products for hundreds of customers, TRD Manufacturing, Inc. of Machesney Park, Illinois (near Rockford), a division of Bimba, one of the leaders in actuation devices, was challenged by an ever-increasing variety of sizes, styles and materials in their workpiece blocks. As VP of Operations Kerry Reinhardt explains, “TRD is a fast-paced manufacturer but very dedicated to high quality and fast turnaround on deliveries. We have an established reputation as a solution provider to the fluid power industry.” The company sells through distribution with its end users found in the general manufacturing, automation integration, mining, forestry, medical, food and various mill industries. TRD products are regularly specified as OEM components, plus the company serves the huge MRO marketplace. Tom Jensen concurs. “We knew AME had a reputation for building top quality fixturing. Their in-house manufacturing capabilities were very impressive and we knew they could handle a project of this size, based on the other customers they serve and the fact that they are just across town from us, which made it easier to work through the preliminary discussions, quoting and final product delivery.” The horizontal machining center (HMC) used for this particular application at TRD is an Enshu GE480H, with 30” x 30” x 30” travel and a 180-position toolchanger, expandable to 240-position. 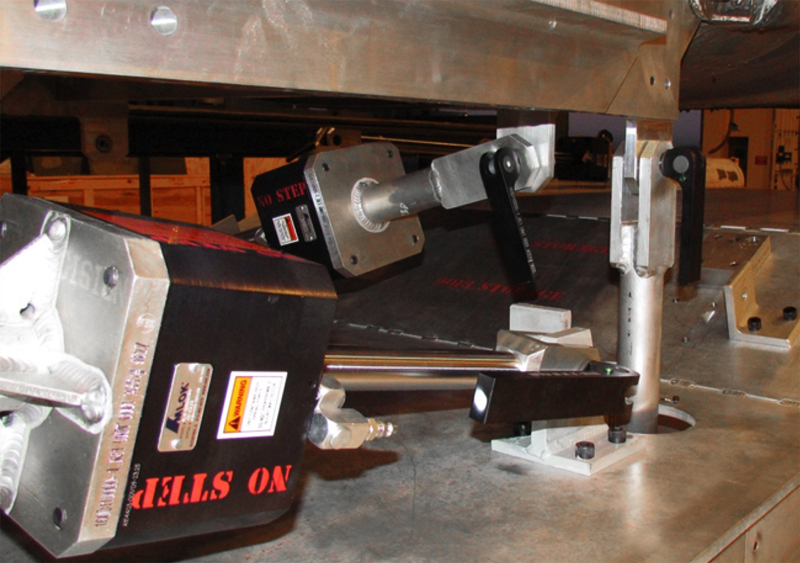 Workpieces are mounted and handled on a Fastems 10-station pallet changer. Currently, the block sizes run at TRD are 56 in number and run in sizes from 1” x 2” x 2” to 3” x 9-1/2” x 14”. Weights range up to 114 lbs. Final part varieties produced on the machine number over 450, made from 1018 steel and 303 stainless. Lot sizes vary from one-offs to 500, but generally run between 25-50 on average. This machining center set-up runs two shifts per day, with the expectation of running 24/7 during peak demand periods. The solution came in the form of ten Triag custom modular tombstone-style fixtures from AME, who partners with Triag, a major European workholding component supplier, as their exclusive North American distributor. 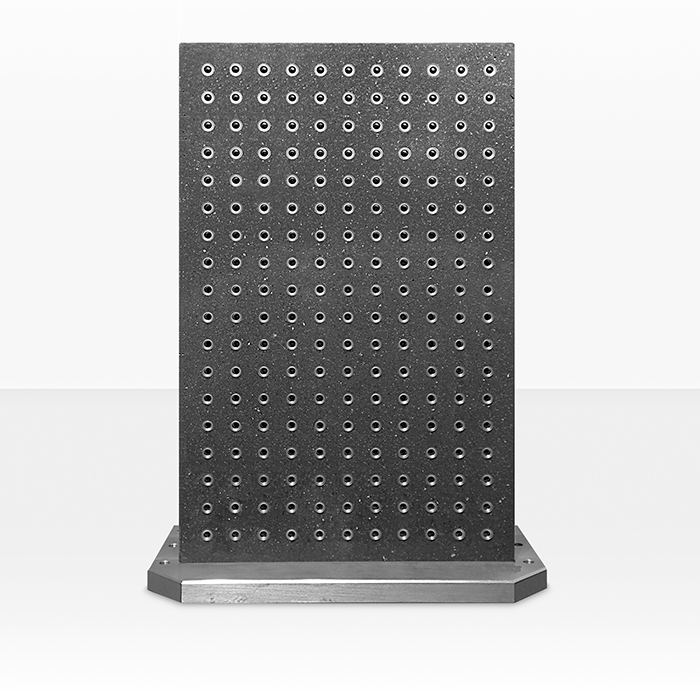 As Jensen notes, “The fixturing in our existing machining cell was fixed, based on block size. AME fixtures use a vise system that quickly adjusts to any size with repeatability, a really key factor in the equation, as it allows all our work shifts to be pre-taught the process. 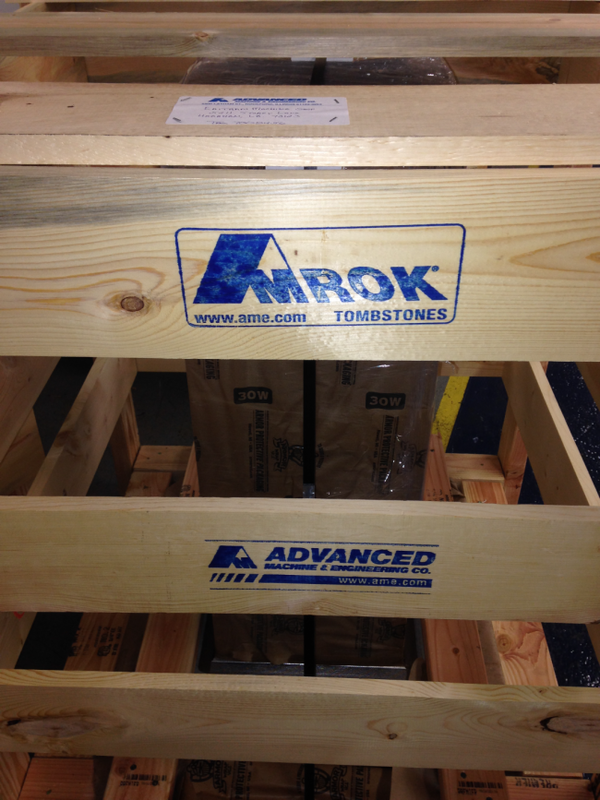 We normally have the fixtures set for specific part sizes but this AME solution now allows us to run any size part on any pallet very quickly for high-volume jobs.” He also observed there was a very short start-up time in the TRD shop, as the flexibility of the tombstone design and the fixturing mechanisms were relatively easy to learn for the operators. Jensen continues, “We met with Alvin Goellner and brainstormed the improvements needed on our current fixturing system. AME laid out a concept and provided drawings for each fixture, which we then reviewed and approved, based on our current production schedules and anticipated workloads, going forward. All the fixtures ordered arrived on-time or ahead of schedule, a very refreshing experience.” Goellner was the lead man for AME on the project, bringing his 20+ years of fixture design and build experience to the task. Because all aspects of this project’s customized manufacturing, assembly and test of the Triag tombstone fixures were done in-house at AME, there was little delay in the processing of the project and all design changes were quickly accommodated, according to Jensen. Reinhardt further commented, “The overall experience was excellent and the results have been outstanding for TRD. The project went well and all our expectations were met.” He estimates the improvement percentage in production on the Enshu HMC to be over 40%, after several months in operation. TRD combines 27 years of precision machining and engineering with an unmatched selection of options and modifications to deliver the highest quality customizable NFPA (National Fluid Power Association) cylinders on the market today. At TRD, the customer’s specials are their specialty. Advanced Machine & Engineering Co., is a manufacturer located in Rockford, IL, serving the Machine Tool Industry with precision components and accessories, including spindle interface components, workholding devices, and, through our sister company, Hennig, machine enclosures, chip removal and filtration systems. The Fluid Power – Safety markets are served with cylinder rod locks and safety catcher devices; and the Production Saw market with our AMSAW® carbide saw machines and Speedcut blade products. AME has manufacturing partners and customers around the world and across the U.S. To learn more, visit www.ame.com. Hennig, Inc. designs and produces custom machine protection and chip/coolant management products for state-of-the-art machine tools, production lines, power generators and other equipment. Hennig products are designed to protect against corrosion, debris and common workplace contaminants. Manufacturing facilities are located in the U.S., Germany, Brazil, India, Japan, France and South Korea. Repair centers are located in Machesney Park, IL; Chandler, OK; Livonia, MI; Blue Ash, OH; Mexico City, Mexico and Saltillo, Mexico. To learn more, visit www.hennigworldwide.com.